This is the first installment of Vicki B &10-year-old Ben on the road. Travel writer Bill Bryson says that traveling internationally is like being 5 years old all over again….you see signs, but you can’t read them, you don’t know what you are supposed to do in a given situation, and you have to ask for help for everything. To me, it feels a lot like starting kindergarten. People told me that I’ll like it, that people will be nice to me, that I’ll learn a lot. Still, I burst into tears when Steve dropped us off at the airport, which surprised both of us. I told him it was all a mistake. A bad idea. I wasn’t ready to go off alone so far away. It was overwhelming, and I was scared. I wanted to get back in the car and go back home where everything is safe and familiar. Going through security. 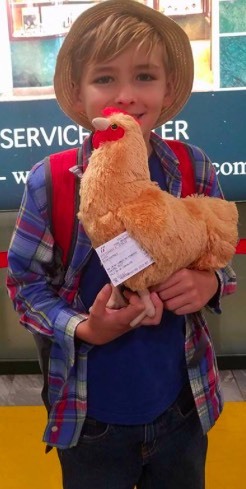 With his chicken. When I started planning our trip I tried to follow Rick Steves’ advice to start with the easiest countries, the ones that speak English, and move progressively to what he calls the “more hairy” countries. I quickly realized that I couldn’t do that, or I’d be spending the hottest part of the year in the hottest climates. For me, Italy is the hairiest country, and that’s where we had to start. I speak no Italian, beyond spaghetti and lasagna, and I was terrified of being lost and unable to read signs or communicate with anyone. I was particularly worried about navigating the transit maze. How do you figure out which train or bus you need, and where to catch it? Secondarily, I was worried about going into restaurants and ordering food. How do you do that when you don’t speak Italian? In short, I was petrified. We’ve been in Italy a week now. It’s a lot like being thrown into the deep end of the pool. You learn to swim really fast. You have no alternative. You just do it. By the fifth day, I could walk into the train station and request “Two Cinque Terre train tickets, please, one adult and one child, for two days.” And I did it mostly in Italian, too. I think we’re going to be ok now. Last night Ben and I agreed we are done with Italy. I’ve learned the lessons Italy had for me. This morning I woke up at 6 am, packed up our backpacks, and we caught the train to Pisa. We’re sitting at the airport waiting for our flight to Barcelona. Hopefully, I won’t be staying in 400-year-old buildings anymore, so I can get online and post some photos.